Everyone in advertising knows that even with a great idea, you still need a reliable vendor to ensure your vision becomes a reality or else you’ll find yourself back on the drawing board. Finding the right production partner is critical for so many reasons, as you not only want to make sure you get a perfect product, but that production is cost efficient, timely and runs smoothly…a.k.a minimizing the chaos. Our newest spotlight goes behind-the-scenes of a notable print production company located in Allen. This is the perfect place to start if you want to learn more about the art of print in advertising. 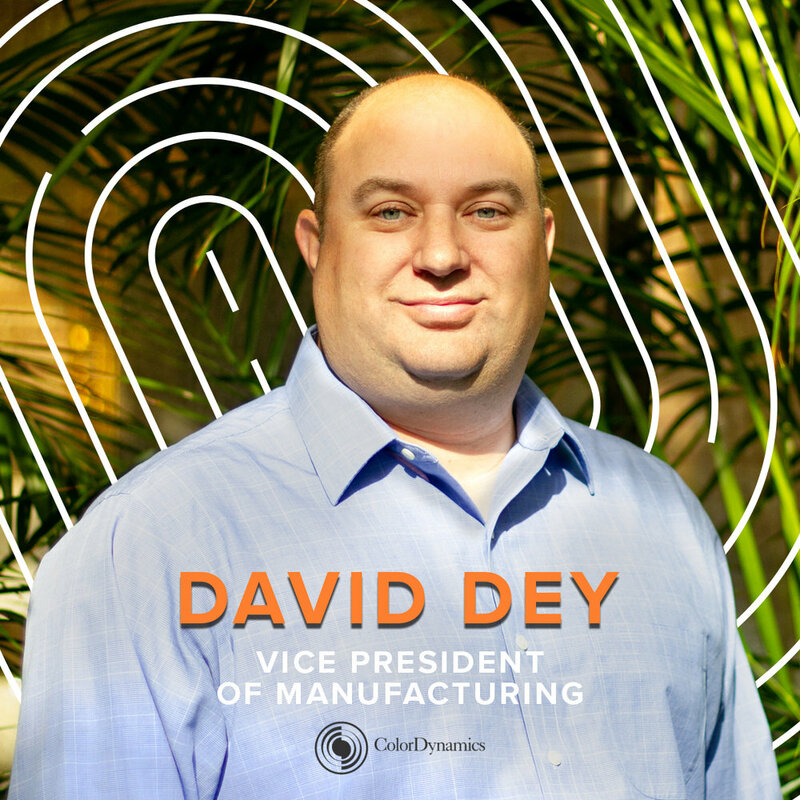 David Dey, Vice President of Manufacturing at ColorDynamics, grew up in St. Paul, Minnesota and studied at the Rochester Institute of Technology where he received his bachelor’s degree in Print Management. After graduation, Dey moved to Dallas and has been here for more than two decades. Learn more about David and his career. What initially drew you to working in the print industry? My interest for the print industry started back in high school when I took an elective printing class. My high school had a large print shop which we used to produce projects for the school district. I really enjoyed seeing and learning the technical and scientific aspects of high-quality printing. Printing plays a huge role in executing creative ideas, how do you best work with creatives to turn their vision into reality? When we work with creatives, we tell them that print isn’t just a visual medium, other senses like touch, scent and function also play critical roles in achieving positive results from the end user. Things such as coating, paper tactile feel, scents and construction are important to consider when developing creative pieces that will be printed. Are there any misconceptions about the printing world or how the printing industry works? One big misconception is that printing is not an eco-friendly process, but rather paper is highly recyclable and is a renewable resource. A key element in the industry is paper forestry management. The turnover rate for digital devices to landfills is high and is actually creating a significant negative impact on the environment. The last decade has shown a huge shift from printed materials to digital mediums, what is your argument for keeping print alive? As the volume of digital interaction has increased it has also become viewed as noise to the end target. We are seeing a shift to increase protections for online safety and spam detection. It is now much harder to get to the target audience digitally and easier for the end users to disregard. Print has a visual, tactile and sometimes olfactory stimulus to drive action from the target user. Direct mail research is showing an increase in response from physical printed media especially in the youngest generations, and an overall response rate of 1200% greater than digital media. What qualities do you think make a great print vendor for advertising and marketing agencies? To be a key partner, a vendor needs to be solutions oriented. These solutions can be equipment, techniques, materials, fulfillment and distribution. Interacting early in the concept stage will allow a great print vendor to offer ideas to maximize the result. Second, a vendor must be able to provide many avenues for their clients. Clients and agencies understand they often need multiple avenues for their message, high volume web to single items coming from wide format devices. Third but most critically, vendors should be experts at controlling their processes to provide the client brand control across all of their verticals. You see a lot of printed materials go in and out of your door, what print trends do you see most often? Two come to mind, the first one is utilizing black as the background. It can be black stocks with white ink or flooding substrates with black and reversing out type and images. The second one is the increased use of tactile coatings such as raised or grit UV coatings or the use of soft touch coatings. The sense of touch has become very popular. How would you describe ColorDynamics to someone who is unfamiliar with the printing industry? ColorDynamics partners with advertisers, agencies and companies to bring a message to their target audience. We provide this through a unique portfolio of equipment and services in a single location. ColorDynamics excels across the gamut from high-volume communication to single location retail signage. What is the range of projects that ColorDynamics is capable of? Our portfolio of print options is unique in the industry especially in a single location; they can range from small static to fully variable digital products. Other products include corporate communication and sales marketing pieces, small or very large direct mail campaigns for educational entities, financial institutions and major retail corporations. Our wide format areas support quick serve restaurants, convenience stores, super markets, cinemas and retail stores with signage, counter advertising and window marketing pieces. What advice would you give designers when they first approach a print project? Is there anything that you feel is overlooked that could greatly affect the design process? It is key to understand the desired length of time the project will be used, how it will be handled by the end target, and how distribution affects the shipping or mailing cost. It’s unfortunate when a designer creates a project best suited for minimal handling but it is sent through US Mail where it is heavily handled. Unlike digital, printed materials cannot be edited once completed. Do you have a project horror story of a time something wrong went to press? There isn’t one particular instance I can recall, but the misspelling of names occurs with some regularity and are usually fixed at the press. I believe designers that have strong understanding of their internal timing allow for proper copy checks to minimize the risk of an issue occurring. For advertising professionals who are unfamiliar with the printing process, what are five things everyone should know when working with a print vendor? 1. Talk to the print vendor early to understand the cost of production. It’s really common for designed concepts and products to not be within the budget constraints of the client. 2. Merchants are keeping less inventory available for JIT orders. It’s important to decide on paper characteristics and quantity early to allow for material to be purchased. 3. Design software is often built to be used on multiple platforms so it’s important to understand which features are geared for digital transmission vs. print production. 4. Understand and clearly communicate your final expectations for the use of the product. Not all print techniques, materials and design concepts lend to all final usage. Products used only for visual stimulus vs. products that will be frequently handled offer unique needs that should be considered in the design and production. 5. Equipment differs on how it applies and dries/cures ink. Using multiple sources for print projects exposes the final product to variability in the look. Print vendor aptitude in controlling color can vary greatly between suppliers. What is the best piece of advice you have received in your career? Treat everyone like they are the president of the company. Most people dismiss people they perceive don’t have roles in making decisions. In the future when they are in decision making positions, they will remember how you treated them and think of you first.